Jeremy Vine presents the aptly titled Jeremy Vine Show on BBC Radio 2, daily between 12 & 2. Jeremy’s show is the most listened-to radio news programme in the UK. On television, he presents BBC One’s Points of View on Sundays, Panorama and Eggheads – one of the longest-running quiz shows in British TV history. He took over the ‘Swingometer’ from Peter Snow for all BBC specials and coverage for General Elections, By-Elections, Referenda, European Elections and US Elections. Previously Jeremy was part of the team presenting BBC 2’s flagship political programme Newsnight. 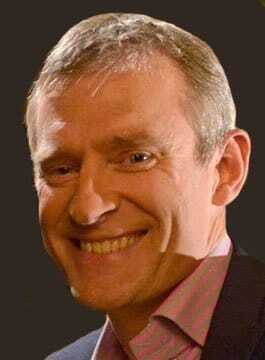 A University of Durham graduate, Jeremy Vine joined the BBC as a news trainee in 1987. His apprenticeship saw him work in Belfast for two years, where he was occasionally drafted in to read the morning news bulletins. He also worked with Joan Bakewell as a researcher on Heart of the Matter. In 1989 he joined BBC Radio 4’s Today programme as a reporter. There his assignments included a posting to Siberia, reporting on the Mafia, and from inside the Middle East. Other jobs were as diverse as covering punishment beatings in Northern Ireland to sheep-racing in Dorset! Jeremy Vine bided his time filling in for more high-profile presenters such as Michael Buerk and Brian Redhead before being appointed political correspondent under John Sergeant. During the 2001 election campaign he travelled the length and breadth of the UK in the ‘Newsnight camper van’ encountering the likes of Jeffrey Archer who challenged him to a race down the beach at Brighton after Jeremy said the Tory party had become increasingly “elderly”. Jeremy turned up, but Archer pulled out citing tiredness. During the same campaign, Peter Mandelson stormed out of an interview and John Major once told him ‘You’re a very impatient boy’! In 2015 Jeremy swapped the ‘Swingometer’ for the Samba, as a hugely popular contestant on ‘Strictly Come Dancing’. An experienced and enthusiastic after-dinner speaker, Jeremy entertains with tailored speeches featuring anecdotes from his career. An in demand conference facilitator and awards host, Jeremy is an engaging presenter and chair. "Jeremy was an absolute gentleman, who was a pleasure to work with and have at the event. His speech was perfect for our audience and hit just the right note." "Jeremy is such a fantastic moderator. He brings a blend of knowledge, experience and humour and is a real crowd pleaser"